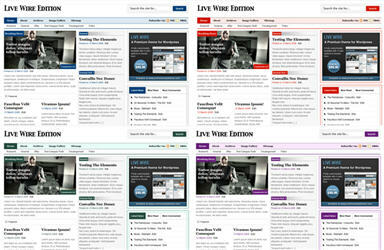 This is the second premium WordPress theme in the Live Wire series and it’s called Live Wire Edition. This one also comes in four different colors green, blue, purple, and red. It’s color scheme is slightly different than the Live Wire Style theme as it uses green instead of orange and the colors are shaded more throughout. This theme is very unique and can be used for any sort of blog or website. It’s the new magazine-style layout and it comes with two different homepage layouts so you can choose which one suits your site best. Can I pay for the template and have it hosted somewhere else with my own url or can you hosted with my own url. @Leo, one you buy this template you need to host it somewhere. You are also allowed to add your own banners and customize it however you like. This is nice! This template is really suitable for magazine site. The dark green one I think is the nicest.